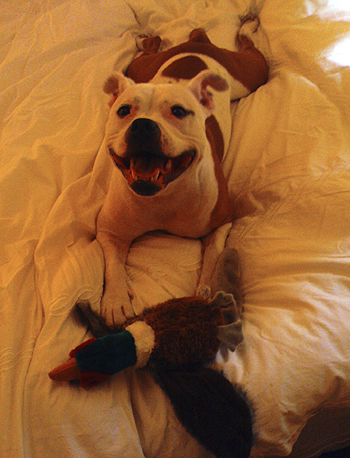 My dog is a 4-year-old Staffordshire Bull Terrier, and her name is Lottie. I have had her since she was about 7 weeks old. As a puppy she would squeal like a piglet, wanting to be picked up and cuddled, and when she was, she would instantly fall asleep, snuffling like an old man. Lottie has had more than her fair share of health problems, including two torn cruciate ligaments and the added post-operative complications of a 6-month-old puppy unwilling to be still enough to recuperate. She also had a tumour on her paw that was benign but required that the toe be removed; broken teeth from chewing stones in the park; a bitten tongue from accidentally chewing on her own face instead of a stick; and the worst and most frustrating of all for both of us, a list of allergies that includes everything from furniture polish to pizza. We first realized the extent of her food problems when she was only home for one day, and I gave her some baby food porridge. She ate it as only a bull terrier would, shoving her whole face into the bowl and inhaling the contents. This was fine, but five minutes later she began whimpering, and her stomach began visibly expanding. We were all horrified. She was tiny and her stomach was so distended that it was lifting her legs off the ground. She looked like a puffing fish with fur! We rushed her to the vet, where we were told it was probably just a reaction to overeating, so after an overnight stay, we took her home and didn’t worry. Gradually we began to notice Lottie repeatedly getting hives and skin conditions, and we took her back to the vet hospital. After trying many different diets, we found that she was allergic to all meats, dairy, bread and virtually everything but white fish. The day of this diagnosis I was so upset by the news that I stopped off at a local supermarket on the way home from the vet to find white fish I could buy for her. The best looking choice for a meat replacement was monkfish, so I asked for a few pieces of that. The guy behind the counter put four generous pieces into a bag, weighed it and said it would be £35 (equivalent to over $54 USD). I mumbled, “Um, yes …” before slinking back to my car and telling Lottie that she had better appreciate what I was doing for her! She looked at it suspiciously, chewed a small piece and promptly spat it back out on the floor. 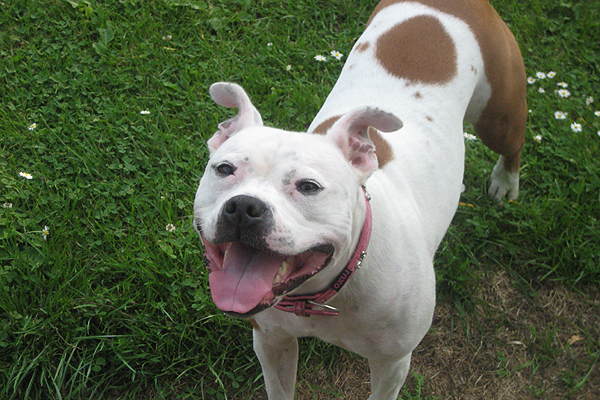 In addition to dealing with her health problems, we had a quite a time settling Lottie into her new home. She was the size of a small hamster but had the teeth of a Great White Shark. I began noticing small things at first: gnaw marks in the legs of the kitchen table and a few nicks in the skirting boards. It’s probably just teething problems, I thought. My biggest mistake was leaving her with the run of the living room when I went to work one day. In my defense, I thought that if she could see out the front window she wouldn’t be bored on her own. She wasn’t bored; she was far too busy. I came home to find the wallpaper stripped off the walls all the way around the room, at Lottie’s height. It had been removed and shredded into little pieces all over the floor. Then I noticed the windowsill on a large bay window, a hefty wooden window sill at least 2 inches thick, in which Lottie had managed to eat a crescent shaped hole 2 feet long. It went through the entire wooden sill. It was then that I saw the couch. My lovely, new, plush, expensive, couch. Lottie had eaten a hole through the side of it, a giant hole, but that wasn’t all. She had then tried to pull all the stuffing out through the hole. In essence, she had nearly turned my couch inside out. I hired a dog trainer. She seemed to be a hypnotist. Lottie would be careening wildly around the house, ears back, legs flailing in all directions, chasing an imaginary rabbit or cat or couch – but when the trainer arrived she became an obedient, pliable, eager-to-please, dream dog. The trainer said that she had separation anxiety, did a few exercises with us and left. Lottie went immediately back to running up the walls and shredding the furniture. As she got older, I began to notice that people gave us wary glances when we were out walking. Some people crossed the road or picked up their kids. Once I even saw a grown man vault over a wall in terror! Lottie is by no means a big dog, weighing maybe 18 kilos (or 39 pounds), but to some people she may as well be a wild bear on a lead. I moved when she was almost a year old. That was when I experienced the most extreme reaction to my lovely dog. She wasn’t on a lead as I felt, naively, like we were still at home. We walked up to put the laundry in the dryers, and on the way back a car skidded to a halt beside us, just outside my home. Jesus, I thought, what is with this guy? “Was it my dog?” No, of course not. “No? Well, OK then,” I said. “You are so irresponsible! I have a small child in the car!” he yelled. At this point I just thought, oh, sod off, and I walked inside and slammed my front door. Fifteen minutes later the doorbell rang. There stood two policemen. “We have received a report of a dangerous dog running loose around these premises,” they said. I couldn’t believe it. My silly, affectionate, happy dog, who at this point was trying to reach her tongue out from behind my legs so she could lick the policemen’s trousers, had merited a visit from the police! I tried to explain but they wouldn’t listen. The man had told them my dog was rampaging around the complex and was a danger to the public. Luckily, they simply asked to see her license and left with a warning that she should not be allowed out without a muzzle and a short leash. I was devastated that someone could have such an adverse reaction to an obviously non-threatening, loving dog. It really upset me to think that any member of the public could get the police to call at my door for no reason other than his own prejudices. I know myself that almost every time there is a report in the media about a dog attack, even before the breed of the dog is confirmed, there is an accompanying photo of a Staffordshire or a pit bull snarling menacingly at the camera. This naturally reinforces the public’s view that these are dangerous dogs. I try to adhere to the law as much as I can, but if there is no one around when I am out walking Lottie, I do let her off the lead and I don’t put a muzzle on her. I tried muzzling her, but aside from the fact that she absolutely hated it, it caused an even worse reaction from people as they automatically presumed she was muzzled for a reason. I even went so far as to buy a pink cloth muzzle on eBay with flowers on it to make her appear less aggressive, but this doesn’t really work. The shame of it is that Staffordshires adore people, and Lottie loves every single person she sees. They are known for being excellent with children and have been given the nickname “nanny dog,” but too few people know any of this. 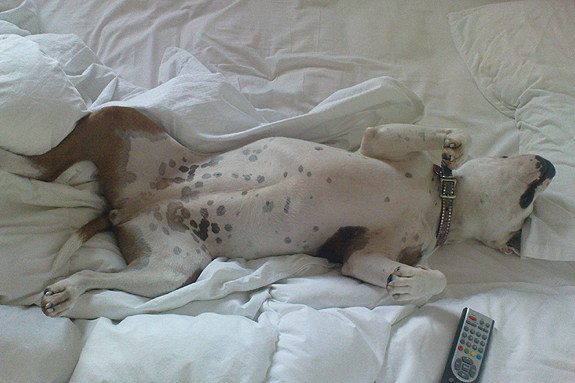 I am thinking of setting up a site, similar to StubbyDog’s, as there is really nothing like it here, and if it does even a slight bit of good or changes one person’s mind about the breed it will be worth it. Your story had me in stitches as I understand how you might’ve felt coming home to see your house in disarray. Many times I’ve come home only to find that Krusher has eaten a pair of my expensive shoes (stillettos). As for the guy who called the police and made the simple remark about him having his children in the car my reaction would’ve been the same as yours. At the same time it shows how simple minded he is. Again like you I feel that muzzle perpetuate the thought that the dog is dangerous and can’t be trusted when that’s not the case. 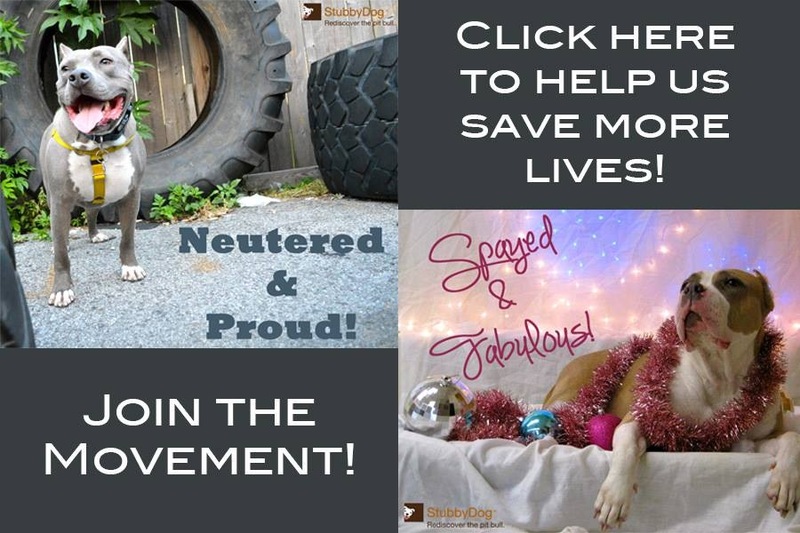 Stubbydog is the best along with other organizations that provide an outlet for responsible pittie owners to show off their dog, take pride and provide those who aren’t “fans” of this bully breed a reliable resource. I understand your frustration, I own 3 of this wonderful breed and feel the hatred from people every day. My 3 are like yours and would never hurt any human, one of mine who is the same colour ar Lottie is a qualified PAT Dog and visits nursing homes. I would of reacted the same way as you to the blooke in the car in fact I probably wouldnt have responded as nicely as you did. Look after Lottie and lottie will look after you, eternally. Thank you for sharing your story. I have two pit bulls who are constantly discriminated against because of their breed. When we bought our new home in 2009, our neighbors immediately began complaining and name calling as soon as they realized what kind of dogs I have. The “man” of that house would often let his yorkie in his backyard at the same time my dogs were let out and then would stand there and yell profanities at me the whole time. His complaint was that he and his family are scared that my dogs will hop the fence and kill their dog and harm them. My dogs have never shown aggression toward anyone, including their yorkie who is very good at instigating trouble. In fact, on numerous occassions they have let their dog have free run of the neighborhood; no leash and no supervision. Many times I’ve picked up that dog and brought it home to them (twice I picked it up from the middle of our busy street) and yet they still continue to complain about my dogs and call me names when I am in the backyard with them. I’ve recently replaced my wooden fence with minor spaces in it (and when I say minor I mean spaces that are less than 1/2 inch apart) for a solid, vinyl 7 foot tall fence. Now I don’t have to look at those neighbors anymore and neither do my dogs. @ashleyrose Thanks, the only way to deal with your neighbors is exactly what you are doing, showing your dogs as ambassadors and showing constraint when necessary. 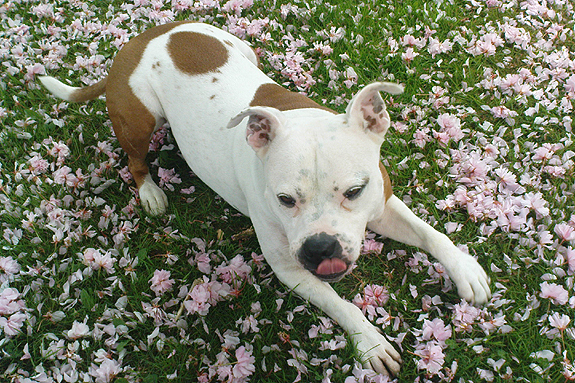 @jbostwick Thank you for giving Cora a loving home, she sounds like a sweetheart. Poor Lottie, it looks as being similar to my new boy, DEDE. Dede also suffers severe skin allergies. It is less difficult to tell you what exactly is just isn’t allergic too. I m going to visit in the veterinarian and ask why Dede have this kind of allergies, I think they got allergies because of the food that they have been eaten outside the house. Get well soon Lottie and take care! @alesiamedas Lottie looks like her allergies don’t slow her down at all. Good luck with your boy Dede.